Resplendent with polychrome application, depicted as a woman breast feeding her infant child, her round face with harmonized features set in an expression of serenity, her hair swept back in a low chignon, her head covered with a skullcap with incised geometric design, her upright torso enveloped in a voluminous robe down to her ankles, the fabric superbly enlivened with vibrant copper-green and vermillion pigments, her hands folded across her torso, cradling the tiny infant, its plump face lovingly carved, seated upon a plinth with two further infant effigies standing at her feet. 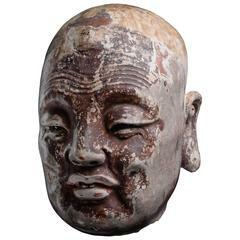 During the Song dynasty, Buddhism was well and truly woven into the fabric of Chinese society. Despite the persecution of Buddhists and demolition of places of worship during the time of the Tang Emperor Wuzong in 845 and Emperor Shizong of the Later Zhou dynasty, Buddhism resisted and thrived. Artworks with Buddhist subject matter abounded. The present figure is a case in point, depicting the ‘bodhisattva’ Guanyin in her aspect as the ‘Bringer of Children’. According to legend, Song Zi Guanyin was a shepherdess and skilled dancer. She was obliged to dance at a banquet held by the king despite her pregnancy. The exertion caused her to miscarry, and she subsequently perished from grief. After her death, she became the wife of Hades, begetting 500 sons in a fruitless effort to find solace from her loss. When this attempt proved in vain, Song Zi nightly metamorphosed into a terrifying spectre to prey on children on earth. One day she returned home to find one of her children missing. Buddha appeared and informed her that he had hidden her child to save her soul. She realised her sin and vowed to bestow each of her 500 children to mortals who were struggling to procreate and prayed for an infant. This legend is an example of a human becoming a ‘gui’ (ghost) that could be transformed into a ‘shen’ (spirit). 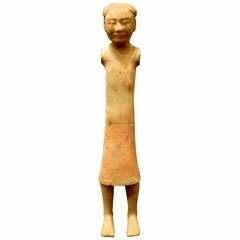 The notably well-preserved form of the present figure is unusual for sculptures dating to the Song dynasty, particularly considering the vibrancy of the pigments and the evenness of the sandstone surface. The sculptural quality of the present figure is remarkable for its symmetry of form and the naturalistic depiction of the mother’s tranquil expression. Such features make for a dynamic and harmonious portrayal of the figure, an embodiment of supreme maternal virtue. 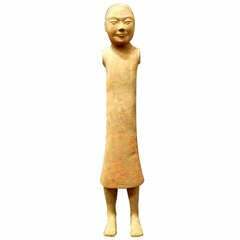 For a similar sculpture compare the present figure with a smaller polychrome sandstone figure of a ‘Sleeping Luohan’, also attributed to the Southern Song dynasty, 13th century, Sotheyby’s, Contemporary Literati: A Gathering, Hong Kong, 7 April, 2014, lot 1691, 47,5cm x 47.5cm. Both figures are remarkably well-preserved examples of Song dynasty Buddhist sculpture. For similar iconography, compare a blanc de chine figure of Guan Yin on display at the Victoria and Albert Museum (FE.20-1970), attributed to the 17th century. The goddess here is represented as the ‘Bringer of Sons’, likewise with an infant on her lap and two children as her disciples standing at the sides of the throne. 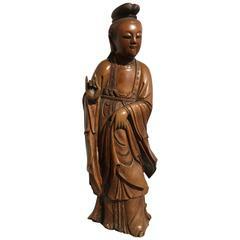 See also a Chinese blanc de Chine Guan Yin, 17th-18th century, sold Christies, Interiors, South Kensington, 11 May 2011, lot 610, 36.8cm high. With continuous garden landscape of figures and pagodas, the whole bordered by cartouches with alternating floral and fruit baskets.